I love, love, love uggs! I just can't help myself. I know they're not elegant, but they're just so warm and comfortable I can't resist them. 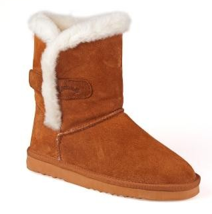 Though because of their price tags I'm always on the look out for cheaper, but real sheepskin boots. Enter Morland's boots. They kindly offered me the opportunity to try their Brue sheepskin boot! The first thing I noticed is they're different from the regular classical tall uggs I normally wear. They're kind of cute! So I headed on over to the Morlands website to check it out. But sure enough, they really are lined with 100% lambswool! The Brue is a classic ladies short boot available in either Chestnut or Mocca suede. It is fully lined with 100% lambswool lining designed to keep you warm and snug this winter. To ensure a comfortable fit there is an adjustable strap. The sole is a lightweight ridged TPRubber classic sole, making this suitable for both indoor and outdoor use. So I decided to just put them on, and take them for a spin. I wore a pair of leggings, which I always do when wearing uggs, but soon I felt the lower part of my legs getting cold. I suppose that was to be expected because these boots are shorter than my classic tall Whooga uggs. Oh well, I was looking cute, and that goes a long way to warming me up. It took some getting used to, wearing shorter boots. But because they were so cute I kept them on all day. Unfortunately that's when I realized the one thing you don't want to realize when you're wearing uggs: my toes were cold! That's not supposed to happen when one is wearing uggs! It was then that I took them off, and put on my old, dirty looking Whooga uggs which have a hole in them. And soon my feet felt nice and toasty. No matter how cute they are, the Brue boots from Morlands didn't keep my feet warm the way sheepskin boots are supposed to. 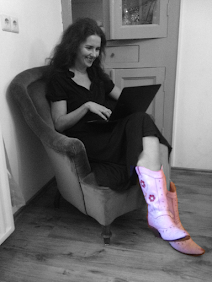 And the proof is in the fact that whenever I have to put on my boots, I choose my ugly Whooga uggs over the much cuter Morlands boots. The Brue boots from Morlands are very cute. But if you're looking for a pair of sheepskin uggs that will keep your feet nice and warm they are probably not what you're looking for. They get 10 points for looking cute, but only 3 points for keeping your feet warm. I asked one of their spokesmen about the wool and how it looks kind of fake. He explained that the wool of English sheep is different from the wool of Australian sheep, and that the Brue boots really are lined with sheepskin wool. However, because they're líned with wool it's not as thick and that explains their lack of warmth. The Morlands Brue boots are on sale right now, and cost 49 GBP or about 76 USD. Find out more at Morlands.